Ethanol subsidies are no longer seen as good, and there are efforts to unplug the subsidy system. But, here is one I was surprised, and made sense when I read more. In the Pacific Northwest Windpower is being unplugged when Hydroelectric capacity peaks, leaving renewable energy projects with no revenue during some periods. That is a painful outage. Everything is working, but no money is flowing. Here is the article in The Economist. THE melting snows of spring and early summer are justly celebrated by Aaron Copland and Walt Whitman. But they are causing a lot of trouble in the Pacific north-west, as a federal power agency pushes private wind turbines off the grid in what critics call a case of favouritism towards electricity generated by federal dams. The region’s windpower companies are enraged and are petitioning the regulators. Encouraged by politicians and their subsidies, they have invested hundreds of millions of dollars over the past six years on a 14-fold increase in generating capacity. But this year, as an unusually large snowmelt surges into the rivers of Oregon and Washington, the wind lobby is howling about government perfidy. “You can’t trust the guy who is running the grid,” says Robert Kahn, executive director of the Northwest & Intermountain Power Producers Coalition. The evil doer is the Bonneville Power Administration (BPA). BPA managers say near-flood conditions in the Columbia river—and strict laws protecting the river’s endangered salmon—give the agency no choice but to disconnect the windmills as it grapples with a large power surplus. Not making electricity is not an option on the river, the BPA argues, because only a limited amount of water can be kept out of turbines and spilled over federal dams. Too much spill dissolves too much nitrogen in the river, which can kill migrating salmon. There is a particular irony in the agency’s concern about fish, since the development of the hydroelectric system is largely responsible for destroying the Columbia as one of the world’s great salmon highways. Makes you wonder as more renewable energy projects can this happen someplace else. The clean-energy glut was predictable, given the tendency of snow to melt in the spring and given whopping increases in the region’s wind-generating capacity. 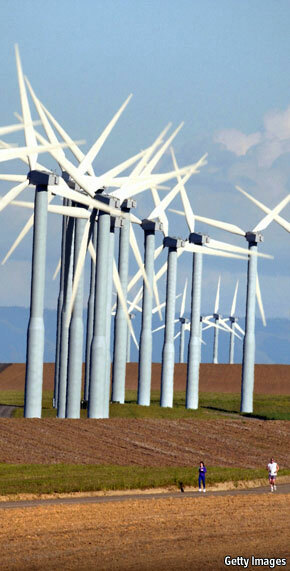 Since 2005 wind capacity has surged from 250 megawatts to 3,500 megawatts, and is expected to double again by 2014. More effort by BPA to link this new capacity to grids in California and British Columbia could have avoided the need to idle those wind turbines, or so a number of power experts reckon.